So said Professor Yoshinori Iizuka, from the Graduate School of Engineering at The University of Tokyo in an interview recorded in 2008. 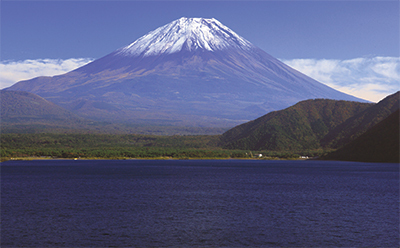 This new age of quality, spiritual structure and self-starting mentality throughout Japan’s manufacturing industry became clear when MetalForming magazine joined two other leading industry publications on a whirlwind tour of Japan. The study mission, held May 13-17, 2013, courtesy of machine-tool builder Amada Co., Ltd., took us to two Amada customers—a small family-owned job-shop fabricator and a large OEM manufacturer. And, we visited Amada’s product showroom and its array of manufacturing operations and development centers. The icing on the cake: An interview with Amada Co. president and CEO Mitsuo Okamoto. 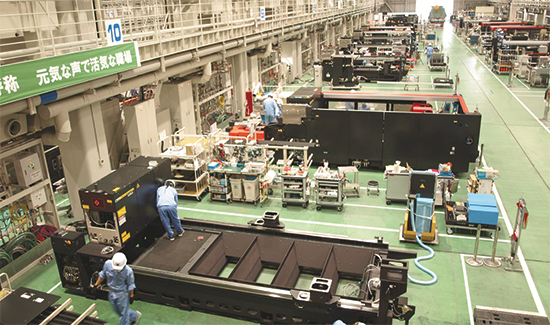 The Amada dedicated laser-machine factory practices the firm’s booth-stand production system. The factory boasts 70 booth stands over nearly 18,000 sq. m of floor space, with the capacity to assemble 140 machines/month. A recent Wall Street Journal op-ed noted that while Japan’s GDP for the first quarter of 2013 showed “surprisingly strong growth,…productivity gains are needed to unleash Japan’s potential after 20 years of stagnation.” Our study mission, if it accomplished nothing else, certainly showcased plenty of tools available for driving sheetmetal-fabricating productivity through the roof—in Japan and around the world. The sheetmetal-fabrication shop at OKI Electric Industry is home to eight robotic press-brake bending cells, including the lineup of Amada Astro-100NT cells shown here. Each Astro-100NT boasts a 110-ton press brake and a pair of material-handling robots. About half of the firm’s press-brake bending is automated, with the goal to become 80-percent automated by 2014. In presenting Amada’s mid-term management plan, Mr. Okamoto notes that the goal is to grow the company’s sales from 190 billion yen in 2012 to 300 billion yen by 2015. At the same time, he expects operating margin to grow from 4 to 15 percent, in part due to its continued development of its cellular production system. We saw the Amada production system (which it calls “booth-stand production”) in action at the Amada Innovation Center in Fujinomiya. The 750,000-sq.-m campus includes a highly automated parts warehouse, a dedicated laser-machine factory, and a plant dedicated to machine-frame welding and coating and turret-disk assembly. The laser-machine factory boasts 70 booth stands over nearly 18,000 sq. m of floor space, with the capacity to assemble 140 machines/month. The leader of our technology tour throughout Japan was Ken Sano, from Amada’s overseas strategic planning department. Here, Sano explains how its customer, Fukasawa Inc., uses an Amada EM255NT turret punch press to fabricate parts from 0.4- to 2.5-mm-thick stainless-steel, mild-steel and aluminum sheet. 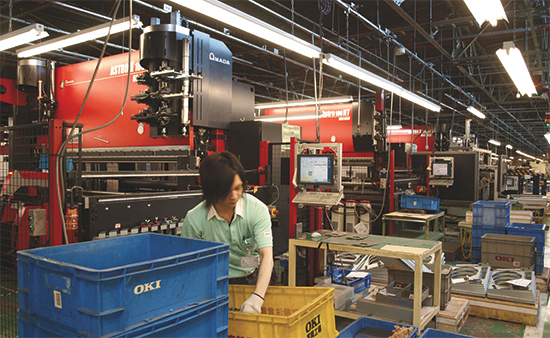 Automation took center stage at Amada customer OKI Electric Industry Co., when we toured its Mechatronics Systems plant in Tomioka. OKI manufactures cash-handling machines (ATMs and the like), airport check-in counters, call-center telecom devices and other similar equipment. The plant encompasses 62,500 sq. m and 825 employees, including 190 who work in sheetmetal fabrication. The fab shop processes as much as 20 tons of sheetmetal/day, primarily 1 to 2 mm thick. Plant general manager and executive officer Yoshiyuki Nakano, with the help of Amada’s translator Yukinaga Nakashima, explained that supplying its assembly lines once had the plant specializing in metal stamping. However, as its business has transitioned to low-volume high-mix metalforming, fabricating processes such as laser cutting, CNC punching and press-brake bending have become core competencies. 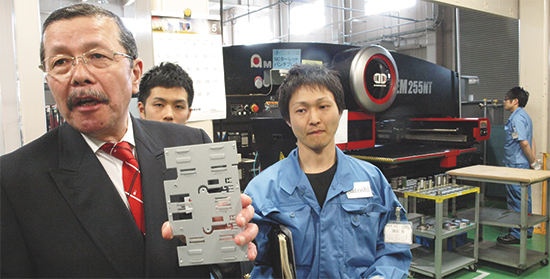 “In 1978, we were the first manufacturer in Japan to install a combination laser-cutting and CNC punching machine,” Nakano said, “and now we have eight combination machines.” Included in this inventory is an Amada Acies punch-laser added in 2011 that Nakano says improves throughput on some parts by nearly 300 percent compared to a standard turret press. In addition to its eight combination machines, the OKI fabrication shop also is home to three stand-alone CNC punching machines, a bevy of press brakes and eight robotic press-brake bending cells—including six Amada Astro-100NT cells. Each Astro-100NT boasts a 110-ton press brake (118-in. bed length) and a pair of material-handling robots. Low-volume high-mix production also was on display at the precision sheetmetal job shop of Fukasawa Inc., in Tokyo. Supporting primarily the home electrical-appliance industry (televisions, office-automation equipment and telecommunication equipment, for example), the firm specializes in prototype development and 3D modeling. This in addition to its full-service fabrication offerings, including laser machining, CNC punching, bending and projection welding. The company categorizes required operator skills into 23 fields, each field with seven grades. Each operator wears a name tag that includes his skill fields and grades. 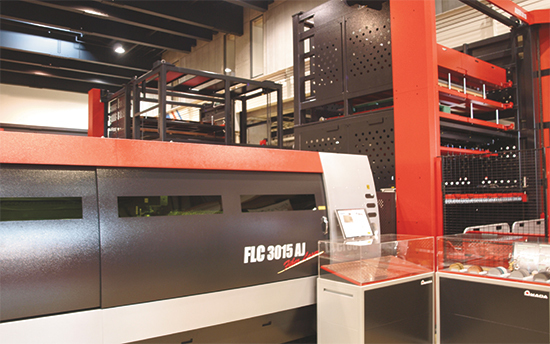 Among the 13 new products on display at the Amada Innovation Fair 2013 Global was this new Model FLC3015AJ three-axis linear-drive 2-kW fiber-laser cutting machine, equipped with Amada’s next-generation material-storage tower, the ASFH. The ASFH, we were told, boasts a 50-percent decrease in cycle time compared to the previous model, and shaves 10 sec. off of pallet-change time. This challenge, I’m sure, rings true to metalformers around the world. That is: the day to day routines (referred to as “tacit knowledge”) practiced by our most experienced machine operators, like riding a bike or playing the piano, are not easily taught to newer employees entering the metalforming arena. Conversely, “explicit knowledge”—technical and more academic-based—can more easily be taught and passed along. So the challenge, as Mr. Kurihara explained, is translating and breaking down the tacit knowledge shared by Fukasawa’s more experienced employees into more digestible and teachable bits of explicit knowledge. Along those lines, our group was privy to a series of standardized worksheets the company has developed. These worksheets capture, step by step, several of the processes the company uses to document its processes, such as quality control and equipment preventive maintenance. Then we toured the 2800-sq.-m factory, starting with a look at CNC programming. Here we learned of the firm’s use of concurrent engineering to quickly move prototype work through to production. A team of four programmers feeds press brakes and turret-punch and laser cutting machines with as many as 40 new programs per day. The Amada Innovation Fair 2013 Global introduced 13 new machines for sheetmetal fabrication, some of which we saw at the EuroBlech tradeshow last fall and reported on in MetalForming magazine. Some of the machines debuting in Japan during the fair will be introduced to the North American market at FABTECH 2013 in Chicago later this year. Others will make their North American debut in 2014. • Lasbend AJ “blank-to-bend” integrated, automated machine combining blanking, forming, tapping and bending. It’s ideally suited to processing small parts in variable lot sizes, with blank size to 400 by 600 mm. • FLC 3015AJ 2-kW fiber-laser cutting machine, offered as a lower-cost alternative to the company’s previously introduced 4-kW fiber-laser cutting machine. • EM 3612 ZRT turret punch press, with four thread-tapping stations integrated in the turret, and a separate setup turret that can be equipped with tools during machine operation that then can feed the tools into the turret as required. • EG 6013 AR robot-tended 600-kN, 1300-mm servo-electric press brake, equipped with an innovative sensor system in the backgauge. Also unique is the use of two drive motors—a low-power fast-acting motor to power rapid ram approach and retract, and a higher-power motor to power the forming operation. • HG 1003 ATC hybrid-drive press brake, rated to 1000-kN force and with a 3110-mm beam. Its automatic tool changer features 15 punch magazines and 18 die magazines. In the plant we spied an array of Amada equipment, including an EM 255NT punching machine flanked by a seven-shelf Ama Space 748 material-storage tower and a Togu III tool grinder. Sheetmetal bending occurs via six manual press brakes, 20 to 80 ton capacity, and an Amada Astro II 100 NT HDS 1030 robotic-bending cell. Fukasawa runs the robotic-bending cell, on its floor since 2008, lights-out (without operator supervision) 70 percent of the time, we were told. Part volumes through the cell average 100 to 800 per setup, and the plant averages 10 setups/day. Also in production: an Amada SDE 3030 servo-mechanical stamping press (rated to 300 tons with 300-mm stroke), and an LC2412 F1 NT 4-kW CO2 laser-cutting machine, one of three laser-cutting machines on the plant floor.